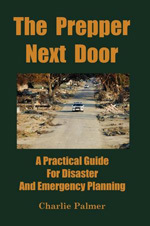 One theme I emphasized in the book The Prepper Next Door is that as preppers we should learn from those who regularly do what we need to learn. People sailing the oceans on small boats and RVers are a great source of information about self sufficiency. Ice fisherman and winter campers are a great source of information about surviving in cold temperatures. Oftentimes, people who don’t see themselves as “preppers” will have the best information. A good example of this is learning about protecting diabetes medicines from hot temperatures. The recent storms in the east have brought this topic to the fore. Many residents have been without electrical power for six days. How do diabetics protect their insulin from the heat? Websites and blogs devoted to helping people live with diabetes are the best source of information. The most common solution we find is keeping ice, dry ice, or refrigeration packs in the freezer. Own a small cooler or insulated pouch. When a storm hits, without electricity, your fridge should stay cool for a day or two. Try not to open the door often. After that, transfer the ice and the insulin to the small cooler, taking care that the insulin doesn’t freeze. Smaller ice cubes melt quicker; larger frozen jugs like 24 oz pop bottles will survive longer. Some recommend freezing larger one-gallon jugs and transferring them to the fridge. They take a lot of freezer space, though. This is a simple and inexpensive solution that will protect temperature sensitive medicines for a few days. One popular product are FRIO bags which use water-activated cooling beads. (A good review.) You can purchase these on Amazon. For longer power outages, a small generator and a small refrigerator provides the longest protection to your medicines. You need to choose a sufficiently small refrigerator that your generator can power it. CompactAppliance.com has a collection of 12 volt mini-refrigerators like the Koolatron P20. Many truckers like these because they can keep drinks cold during long hauls. A Koolatron P9 eight quart 12 volt cooler is about $80. The 18 quart P20 draws 4.5 amps (54 watts). These will drain a car battery pretty rapidly. To power these for several days, a small generator is best. Small portable generators, thou pricey, are impressive. Camping Life has a nice comparison of small generators (2006). One impressive model is the Yamaha EF2000iS. It can provide 1,600 watts and weighs only 44 pounds. It’s expensive at $1,000. It has one 12 volt DC outlet capable of providing up to 8 amps. It has two 115 volt AC outlets. Two things are particularly impressive about these generators. They’re quiet. This is important if you live in the city where generator noise might be an issue. Yamaha says their inverter generators provide a clean, pure sine wave for AC power comparable to what you get from the power company. As mentioned in The Prepper Next Door, having a pure sine wave AC generator can be important for backing up certain medical devices like sleep apnea machines. Even larger generators are nice because you can run an air conditioner, lights, your entire refrigerator/freezer, and a TV set. They take a lot of fuel and are too often rather noisy. Information about diabetes during emergencies from the Mayo Clinic. TheDailyPrep.com. Here’s a great blog that encourages us to take simple steps everyday to be self reliant.